I’m sure we have all heard someone say things like, “he cheated the pocket” or “he used the whole pocket on that shot.” What does it mean? How can we use this to our advantage? In this article, I hope to explain how we can use this theory to help alter the path of the cue ball after contacting the object ball. This will help us play better, more precise position for our next shot, or allow us to play break out shots that were otherwise very tricky. The World Pool Association states that the opening from point to point (mouth) on the corner pockets needs to be between 4 ½ and 4 5/8 inches. Side pockets should be a half-inch wider, between 5 and 5 ¼ inches. First of all, we need to understand a few things about the equipment we play on. The pockets on most tables are between 4 ½ inches wide and 5 inches wide. Why is that important? It is important because a standard pool ball is only 2 ¼ inches in diameter. That means that the pocket is twice as big or more than the object ball. Sometimes, you hear players talk about how tight the pockets are on a certain table, or how big they are. They are referring to the distance between the points of the pocket. You may also have heard someone talk about how deep the pockets are. This is referring to how far back the shelf of the slate goes before the ball falls off into the pocket. The tangent line is a line that bisects the shot line at 90 degrees from the point of contact. Tangent lines tell us where the cue ball is going to go after contact with the object ball (stun shot). This helps us play position for the next shot. 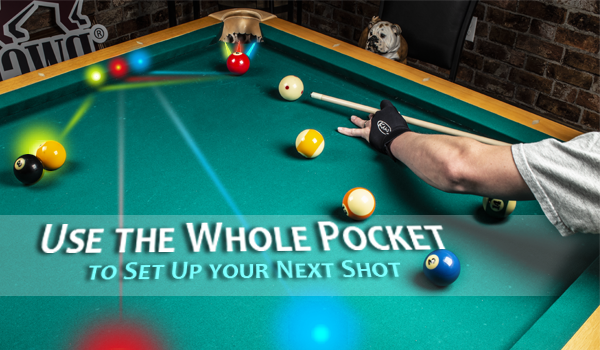 By “cheating” the pocket, you’re able to set yourself up for your next shot. 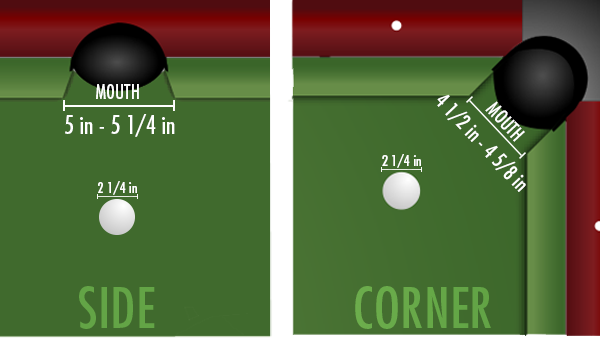 The tangent line will take the cue ball on a path off the rail to set up your next shot. Here is where things get really exciting. If we start paying more attention to our aim and being more precise, we can make the object ball enter the pocket in different places. This is hugely important to position play. If you change the line of the shot, you also change the tangent line. Changing the tangent line will allow you to put the cue ball in different places, opening up more options for position play and breaking out of clusters of balls. If you look at the picture above, you can see the different subtle changes that happen to the tangent line when we enter the pocket at different points. Frank Says: "Sharpen your accuracy with the Practice Pro Pocket Reducers! Practice with these and in matches, the pockets will feel like buckets!" So remember folks, cheating the pocket is a good thing. Sometimes you have to stray away from hitting the middle of the target in order to put the cue ball in a more favorable position.